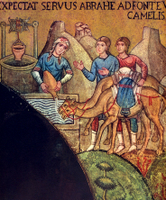 Rebecca at the Well, from Art in the Christian Tradition, a project of the Vanderbilt Divinity Library, Nashville, TN. http://diglib.library.vanderbilt.edu/act-imagelink.pl?RC=46194 [retrieved April 19, 2019]. Les Mosaiques de la Chapelle Palatine de Palerme. Belli, Annibale and Pietro Toesca. Milano, Edizioni d'arte Sidera, 1955.